Once you have invested in effective signage, it is important to have it illuminated properly 100% of the time. At Lewis Sign, we have a team of licensed service technicians who have decades of experience that are ready to give your sign the attention it needs. Our maintenance trucks are stocked with large quantities and a wide variety of parts that any sign could possibly need. Lewis Sign can clean your sign or fascia with a power washer. It is very important that you keep your sign clean and lighting 100% of the time. This increases the efficiency and longevity of your sign. A clean and properly illuminated sign tells your customers that you care about your image and gives them confidence in your ability to deliver a quality product. "The folks at Lewis Sign have been manufacturing, servicing and installing signs for our company since the early 1980’s. Over the last three decades, we at Austaco have rown accustomed to the excellent customer service that we receive every time we deal with Lewis Sign. 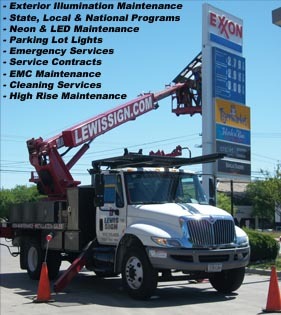 When you need your sign work done right the first time, give Lewis Sign a call”.